← Sooooo, Ya Wanna Be A Writer. Me Too. But First…………………..
It’s been a few weeks since some serious news worthy whining has been in the news. FINALLY the whiner of all whiner of all whiners has saved us all from being whiner deficient. Oh God thank you Karl Rove. 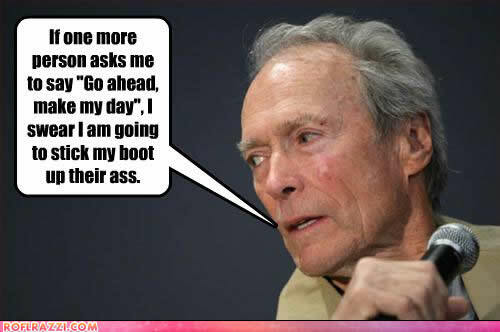 By the way….sorry Clint…but I had to use that famous saying of yours, “Go ahead and make my day.” Um, does that mean I have to watch myself when I bend over. Yikes! So let us put all of this earth shattering news into perspective for those of you who are earth shattering news deficient. Lot of deficiencies going on in the world these days. Clint cut a commercial spot for Chrysler Corporation which promotes the message of job growth and the spirit of America which was shown during the Super Bowl game on Sunday. And, you know how anyone opposed to job growth and spirits, (booze) in America can get all bent outta shape hearing that left-wing unpatriotic stuff. It IS unpatriotic isn’t it? Anyhow, critics, including Rove claim that the commercial supports President Obama and that in essence it amounts to a love letter. Now I watched that commercial and I do not see Clint throwing any kisses to Obama or suggesting that the two meet in a secluded cafe anywhere soon. I could be mistaken, but from my point of view, there were no overtones to that effect. Just a downright patriotic car commercial for Chrysler and the American way. Perhaps he should have included the phrase, “Hot dogs, apple pie and Chevrolet”…but, then again, the ad WAS for Chrysler. In the ad called, “Halftime In America” … Eastwood praises the resiliency of the American spirit as demonstrated by the auto industry’s efforts to bounce back from its financial woes. Eastwood said that he is “not supporting any politician at this time,” but, noted that, if Obama or any other politician “want to run with the spirit of that ad, go for it.” Or he could have gone a step further and asked that the Pres purchase a Chrysler. My thought anyhow. 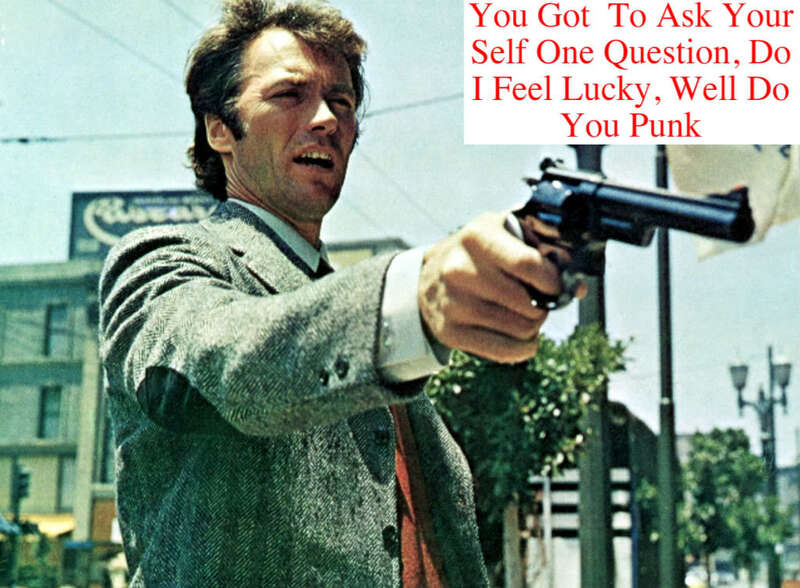 In one scene from the commercial ,Clint snarls at the camera and says in a typical Dirty Harry tone, “This country can’t be knocked out with one punch, we get right back up again.” Growl, snarl, growl…..ya dirty punks. 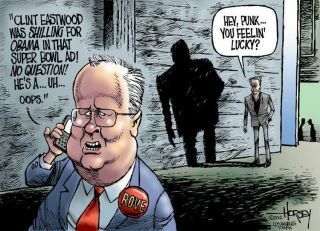 Step in whiner Rove, hopefully in front of a speeding Chrysler doing 76 mph while commenting on the ad on Fox News. Now let me see if I understand this correctly. ROVE is complaining about corporate advertising? The SAME Rove that runs a super-pac that can spend gazillions of dollars on political advertising? WTF! Me thinkith something is rotten in Denmark….and in Karl Roves pants. Namely bull***t. DEPENDS KARL!!! DEPENDS! Start wearing them for cripes sake! 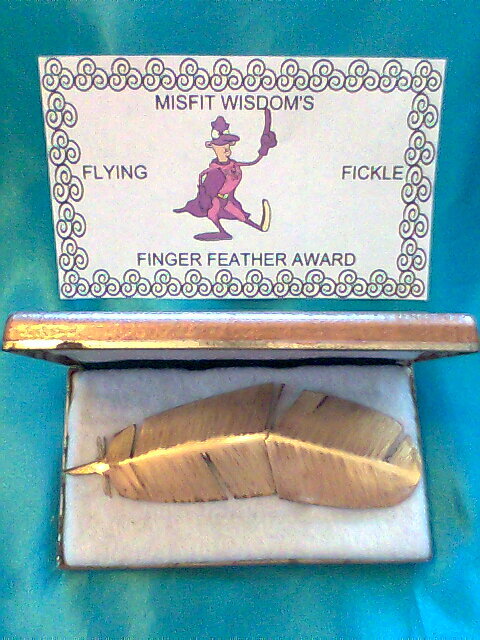 Presented to "Karl Rove" in the category of ultimate stupidity. Congratulations Karl. Yep….panic because if the President starts looking good it’s not good for the opposition when it comes to the one most important issue for this years election. Beating Obama. And we all know THAT is the most import issue that affects each and every one of us in our everyday lives. So, in conclusion I would suggest Clint get a bit tougher with Rove and anyone else who criticizes that ad and thinks it has to do with promoting the President and or his re-election. Maybe a revision of his famous line in one of those “Dirty Harry” movies. (DONATE) The MisfitWisdom ever unpopular PayPal donate link is posted below. If it is not highlighted, (blue) most likely Karl Rove had it deleted because it is usually in blue and as we all know the Republican color is red while Democrats color is blue. In that event, simply copy and paste it into your browser to go to the PayPay site which is totally non partisan and I believe colored in puce. This entry was posted in Uncategorized and tagged Chrysler, Clint Eastwood, Dirty Harry, Fox News, Karl Rove, Obama, Super Bowl, Super pacs. Bookmark the permalink.